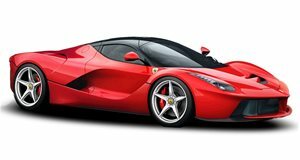 Is An Even Faster LaFerrari In The Works? Why, exactly, is Ferrari still testing a car that has already debuted? You might recall that we recently ran a video of a pair of LaFerraris doing hot laps around a test track, one in stock trim and one apparently testing out a new exhaust system. Well, now we have some additional photos of yet more testing being done on Ferrari’s newest hypercar. The car in the photos is wearing even more camo than the one in the video, which is a bit odd for a few reasons, with the main one being that the LaFerrari has already debuted. You don’t normally see a car testing and/or decked out in camouflage after it has already been revealed to the public, so this begs the question of what it is exactly that Ferrari is doing. Since we know it was being tested with a much louder exhaust, one of the more plausible theories is that the car being tested is a higher-performance and more track focused version of the car, giving the LaFerrari a similar treatment to the one recently given to the 458 Speciale. But, at the moment, this is all conjecture. What do you think is going on here?